Left: Consolidated Lunar Atlas Plate E9, showing the two Roman-numeraled rilles in the System of Lunar Craters. Hypatia I has two distinct parts. 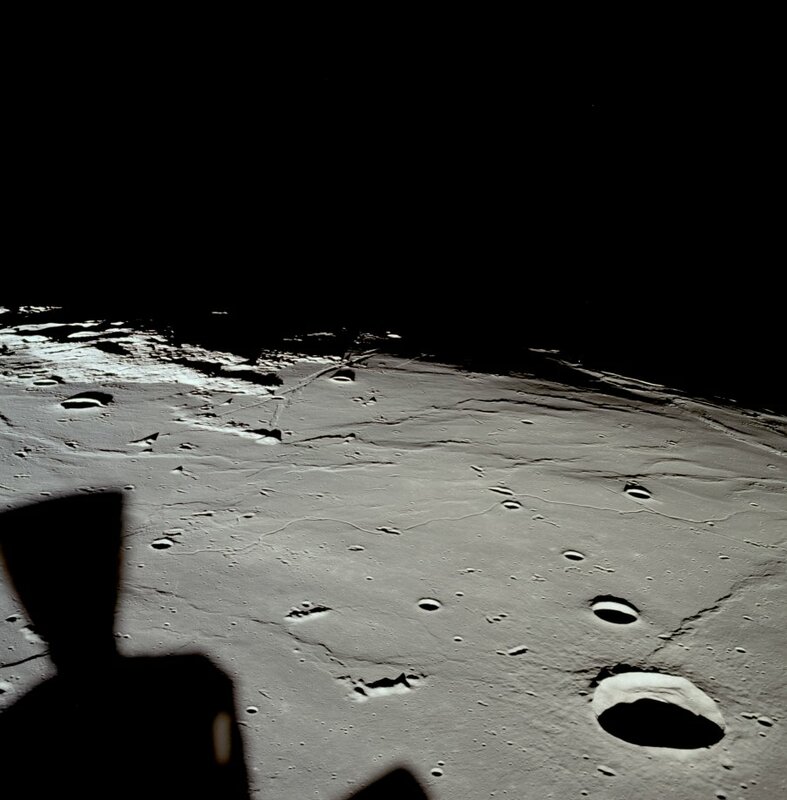 The large twin craters in the upper left are Ritter (left) and Sabine (right) with the much smaller and deeply shadowed Schmidt cut by the margin below them. The small bright crater a little north of Hypatia I (towards the right) is Moltke. To the right of the Roman numeral II label is a row of four small craters. These are (from left to right) Aldrin, Sabine C (above the Roman numeral I label and slightly below the main line), Collins, and Armstrong. The landing site of the Apollo 11 astronauts (after whom these are named) is located near the named crater West, much too small to be seen here, but slightly to the east of the tiny "Cat's Paw" to the upper right of the top of the Roman numeral I). The rilles’ namesake crater, Hypatia is slightly out of the field to the south. The large system of interlocking circular ridges in the bottom part of the frame is not named, although many of the craters within it are regarded as lettered satellites of various named craters in the vicinity. (IAU Directions).-- From a mountain arm extending from the S. wall (of Sabine), run in a easterly direction two nearly parallel clefts skirting the edge of the Mare. The more southerly of these terminates near a depression on a rocky headland projecting from the coast-line, and the other stops a few miles short of this. A third cleft, commencing at a point N.W. of the headland, runs in the same direction up to a small crater near the N. end of another cape-like projection. At 8 h. on April 9, 1886, when the morning terminator bisected Sabine, I traced it still farther in the same direction. All these clefts exhibit considerable variations in width, but become narrower as they proceed eastwards. The name Hypatia I was included in the original IAU nomenclature of Blagg and Müller (1935). Hypatia II was added in the System of Lunar Craters, where the combination of the two was renamed Rimae Hypatia. In 1973, the IAU declared its intention to revise the lunar nomenclature in such a way that "Rimae and Rima systems will receive new and more appropriate designations" (IAU Transactions XVB). Such renaming never appears to have happened, so the status of the old Roman-numeraled designations (pending the promised re-naming) is unclear. During the first lunar missions of project Apollo (the equatorial missions), Hypatia I was nicknamed "U.S. Highway Number One" (or "U.S.-1") and Hypatia II was called "Wagon Road" (see Phil Stooke's LPOD, 10 September 2007). A Portfolio of Lunar Drawings (Harold Hill), pages 172, 173. This page was last edited on 16 April 2018, at 03:12.